A total of 145 cars registered and were on display. Cars were parked around Zumwalt Park on M and N streets. There were 7 food vendors and 20 non-food vendors ranging from the Tulare Community Health Clinic to the Tulare Animal Shelter. The weather was perfect, walking around the park was fun and everyone I talked to was having fun, said Ben. 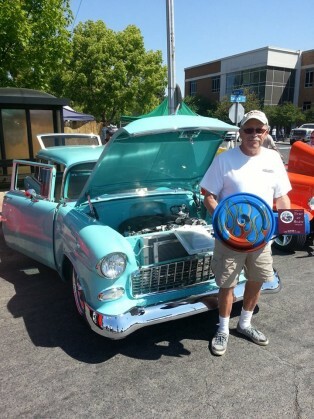 In addition to the car show the Tulare Downtown Association hosted a beer garden and an Easter egg hunt for the kids. Items were raffled off throughout the day and one winner made $400 off of the 50/50 drawing. The Tulare Chamber of Commerce thanks all of the t-shirt and trophy sponsors as well as the following Event Sponsors; (Title Sponsors) Merle Stone Chevrolet, Will Tiesiera Ford, Sturgeon & Beck, Inc., Tulare Community Health Clinic, Bud Light (Associate Sponsors) Horswill, Mederos & Soares, Lane Engineers, Inc., HCCA, Citizens Business Bank, Land O’ Lakes.